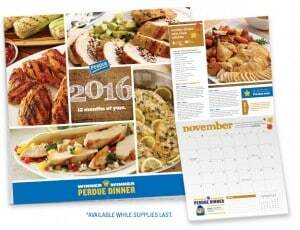 Right now, you can sign up to receive a FREE calendar for 2016 from Perdue! The calendar comes with recipes and cooking tips. These calendars are going quickly, so request yours while you can! To get your FREE Perdue calendar, enter your mailing info and submit your request. You can also opt to sign up for the Perdue e-newsletter.